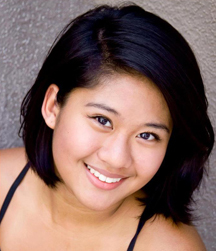 Born in Portsmouth, Virginia, Jessica Anonuevo began dance training at Maureen’s School of Dance at the age of five and after a year joined the school’s competitive dance company. After years of competing and performing around the country she began study at the Governor’s School for the Arts in Norfolk, Virginia. There she majored in modern with a concentrations in Horton and Hawkins Technique. Through her exposure in competitive dance and study at the Governor’s School she has worked with artists in the commercial and freelance dance scenes. Such artists include Allison Holker, Malcom Burn, Michael Blake, Janelle Spruill, and Todd Rosenlieb. Jessica also has worked as a teacher’s assistant for Tessandra Chavez and Ade Obayomi. She has attended many dance intensives and conservatories including Joffery West, Alvin Ailey, and Jacob’s Pillow. She has performed with companies such as Todd Rosenlieb Dance Company, Richmond Ballet, and Alonzo King LINES. She has completed her BFA in Dance at Temple University and she continues teaching and performing in Philadelphia. Dez was born in Queens, NY. She began dancing at American Dance and Drama Studio at the age of 8 working in various genres from ballet, jazz, hip hop and modern. Even though she was well rounded in various styles, Miss Dez connected to hip hop the most. Miss Dez has had the opportunity to train at Alvin Ailey and Broadway Dance Center. She has been teaching hip hop for the past 7 years and enjoys creating. She has received various awards for her choreography and continues to strive for greatness, not only for herself but her students as well! Jordyn McNichols grew up in Connecticut. She began dancing at the age of 2 and studied jazz, tap, lyrical, ballet, and pointe at a local competitive dance studio. At the age of 16 she began her professional career dancing with the Albano Ballet Company, in Hartford, CT. After graduating high school she moved to Philadelphia to attend the University of the Arts and, in 2013, graduated with a BFA in Ballet Performance and Education. Jordyn has had the opportunity to work with esteemed choreographers such as Joseph Albano, formerly of the Ballet Russes, Julia Frederik, soloist for George Balanchine, Ronen Koresh, Christine Cox, and John Alleyne to name a few. Jordyn is very excited to be a part of the ZGfamily and to be able to share her knowledge and love of the art of dance with this great group of students. Miss Elian has lived her entire life in Elkins Park. She began dancing at Metropolitan Ballet at a very young age. Miss Elian decided to follow her sister to dance with Miss Liz and started dancing with every style of dance. As her love of dancing matured, she studied at Koresh and Broadway Dance Center. Miss Elian found that her creativity was best expressed through contemporary and modern dance. Although she loves every style, these two styles are closest to her heart. She spends hours trying to find the perfect music to compliment her unique choreography. She has won several choreography awards and continues to enjoy teaching and watching her students grow and learn how to express themselves through dance. Born and raised in rural Maryland, Madelyn (Miss Maddie) has harbored a passion for dance from a very young age. Throughout her training she has been exposed to a variety of different styles of movement and processes of dance-making. Miss Maddie is a recent graduate of the University of the Arts and has obtained a BFA in Dance. At U Arts, Maddie has had the privilege of working with Jean Smith, Thaddeus Davis, Kim Bears-Bailey, and Katie Swords Thurman. Maddie has been able to perform her own pieces on stage as well as take a workshop in Paris hosted by the Centre National de la Danse. With a passion for creating and performing, Maddie is immeasurably greatful for each opportunity she has to share her art. Maddie's favorite style of dance to watch is hip hop, but you won't find her dancing it! You'll most likely see her performing a modern or lyrical piece. Allison was born and raised in Philadelphia and began dancing at the age of three with a local studio, Dance Dynamics. In high school, Miss Allison was able to start taking classes in modern and pointe from En Pointe Dance Studio, where she continues to perform in annual productions of the Nutcracker. Allison has recently graduated from Temple University and, during her time there,started a modern dance company on campus. After graduating, Allison wanted to continue her love of dance. She joined both our team and En Pointe Dance Studio as a teacher. Her favorite styles of dance are ballet/pointe and modern, both of which she teaches here! Shakay was born and raised in Elkins Park, PA. At the age of 6, Shakay began taking dance classes at a local studio. After trying 10 different studios, Shakay finally found her home at Elizabeth's School of Dance (now ZGDC) a few years later. Miss Shakay was able to take classes through Broadway Dance Center, Alvin Ailey, Metropolitan Ballet Academy, and DejANCE. At 15 she became an all-star cheerleader and continued to cheer in Cheltenham High School. Shakay began to teach at ZGDC while in college primarily in hip-hop. You can see her Senior Hip Hop group compete this upcoming year!